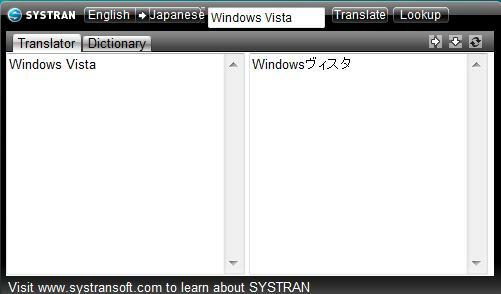 Translators or multi-linguists will love this Windows Vista sidebar gadget. Systran, a leading language machine translation software provider, where its technology powers the online translation services of Yahoo!, AltaVista Babel Fish and Google among others, has offered a free sidebar gadget based on the new features of the SYSTRAN V6 translation engine. Systran Translator and Dictionary sidebar gadget provides translation of 14 languages, namely English, Arabic, Chinese, Dutch, French, German, Italian, Japanese, Korean, Polish, Portuguese, Russian, Spanish and Swedish. In total, users able to translate over 52 language pair combinations. Other than translation, the sidebar gadget is also bilingual dictionaries, where users can lookup the definition and meaning of a word in their native language, automatically translated. In Windows Vista, the gadget not necessary has to reside in the sidebar. You can drag and drop it anyway on the desktop. 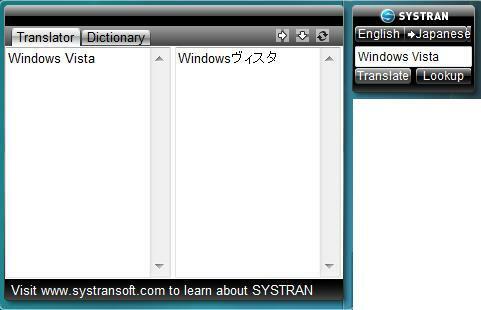 Download and install Systran Translator and Dictionary sidebar gadget in Windows Vista from here (discontinued).